For small businesses, creating a strong web presence is one of the most important things they can do to grow – yet it is also seen as one of the most challenging, expensive and difficult to maintain. 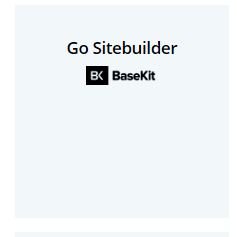 Go Sitebuilder is a simple, cost-effective and complete web presence solution developed just for them. It contains everything your customers need to build a professional looking, mobile-first website, including a library of stock images, an e-commerce store, a personalised domain name and a business email address. It’s all in one place for them without multiple logins or bills.